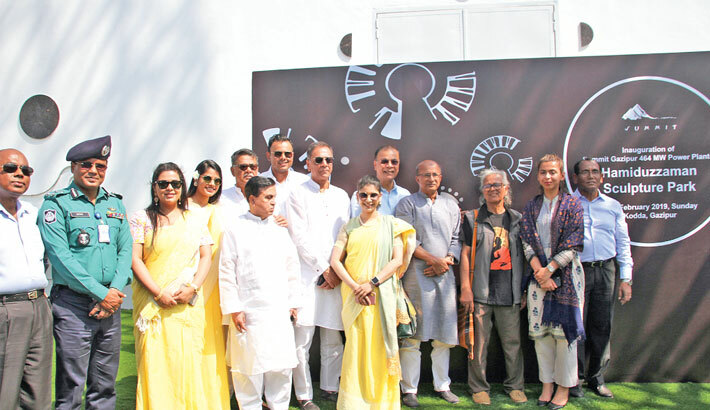 Prime Minister’s Energy, Power and Mineral Resources Advisor Dr Tawfiq-e-Elahi Chowdhury inaugurated the country’s longest mural (painting on a wall) at Summit Gazipur 464 MW Power Plant’s Hamiduzzaman Sculpture Park at Kodda, Gazipur on Sunday. The sculpture park has Bangladesh’s longest (340 feet-long) mural titled ‘Srom o Sristi’ and sculptures with themes ‘World in a frame’ and ‘Life & Lifeless’. The open-air sculpture park with natural setting enhances Summit’s unique love for art. The large-scale mural and contemporary sculpture garden is one of the significant art projects of Summit and is a testimony of the symbiotic relationship between industrialisation and work of art. Summit believes that true growth can be achieved if there is a balance between work and art. BPDB Member (company affairs) Md. Mustafizur Rahman, PGCB chief engineer Md. Iqbal Azam, chief of Gazipur Metropolitan Police YM Belalur Rahman, DC - Gazipur Dr Dewan Muhammad Humayun Kabir. Summit Group vice-chairman Md Latif Khan, Md Farid Khan, Jafer Ummeed Khan, director Anjuman Aziz Khan, director Helal Uddin Ahmed, AMD of Summit Corporation Faisal Karim Khan, director Azeeza Aziz Khan, director Fadiah Khan, managing director of Summit Power Ltd Gen (Retd) Engr. Abdul Wadud, managing director of Summit Gazipur I & II Eng Md Mozammel Hossain and others attended the programme.